Landmark Square, Stamford, Conn. 06901. James R. Barker, chairman and chief executive officer, told the meeting that "the broadened scope of the company's activities in trans- portation and natural resources, the reason for this name change, is evi- dent in results for 1973." Lakes bulk carrier fleet, and acting as a sales agent for various ma- terials. Collision Avoidance. You can expand into an integrated bridge system, with full navigation and data processing capability. Compare Sperry advantages and Sperry prices. Let us show you how easy it is to operate and maintain . . . and how economical. 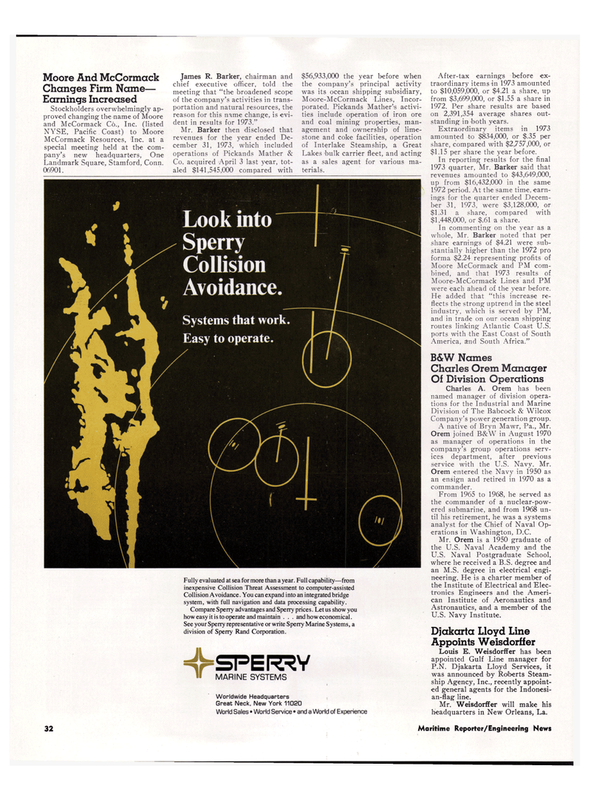 See your Sperry representative or write Sperry Marine Systems, a division of Sperry Rand Corporation. After-tax earnings before ex- traordinary items in 1973 amounted to $10,059,000, or $4.21 a share, up from $3,699,000, or $1.55 a share in 1972. Per share results are based on 2,391,354 average shares out- standing in both years. In reporting results for the final 1973 quarter, Mr. Barker said that revenues amounted to $43,649,000, up from $16,432,000 in the same 1972 period. At the same time, earn- ings for the quarter ended Decem- ber 31, 1973, were $3,128,000, or $1.31 a share, compared with $1,448,000, or $.61 a share. Moore-McCormack Lines and PM were each ahead of the year before. A native of Bryn Mawr, Pa., Mr.
Orem joined B&W in August 1970 as manager of operations in the company's group operations serv- ices department, after previous service with the U.S. Navy. Mr.
Orem entered the Navy in 1950 as an ensign and retired in 1970 as a commander. From 1965 to 1968, he served as the commander of a nuclear-pow- ered submarine, and from 1968 un- til his retirement, he was a systems analyst for the Chief of Naval Op- erations in Washington, D.C.
P.N. Djakarta Lloyd Services, it was announced by Roberts Steam- ship Agency, Inc., recently appoint- ed general agents for the Indonesi- an-flag line.